JTECH-4K-EX-HDBaseT is a 4K HDBaseT extender. One pair as a full functional module, no need for setting. It extends Ultra HD source to the destination with Lates HDCP content protection version 2.2. - Transmission distance reaches up to 70 meters under the video format of 1080P and 4K up to 40 meters. - LED indicators to show the power status. 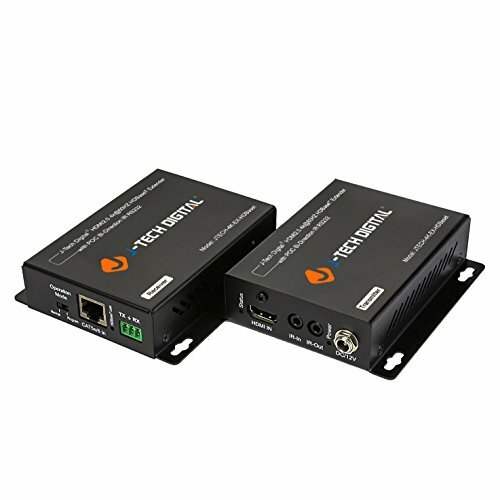 - Transfer Bidirectional Infrared control signal together with the HDMI signal. - RS232 Port for firmware update or RS232 control signal transmission. HDMI 2.0 EXTENDER OVER Cat5e/6 CABLE: Extend 1080P up to 230 feet (70 meters) or 4K@60Hz (4:2:0) up to 130 feet (40 meters) over Cat5e/6 UTP cable. Support 1080P 3D. The video is transmitted using uncomppressed HDBaseT technolgy. 60HZ 4K ULTRA HD SUPPORT: 60Hz@4K, 1080P,1080P 3D, 1080I, 720P, 576P, 576I, 480P, 480I; WIDE DIGITAL AUDIO COMPATIBILITY: supports LPCM, DTS HD and Dolby trueHD. HDMI 2.0 FEATURES: Supports HDMI2.0 4K 60Hz YUV420; LATEST HDCP 2.2 / 1.4 COMPLIANT:We guarantee you will never feel frustrated when streaming your favorite copy protected video through this product. INDUSTRIAL-LEVEL RELIABILITY: The JTECH-4K-EX-HDBaseT is built on State-of-the-art embedded chipset with ESD protection inside and has been passed thousands of hours of tests under different and sophisticated applications which include security systems, outdoor advertising screens, broadcasting stations, and public theaters etc. DUAL IR 20 - 60 KHZ Backward and Forward Extension: Extends IR signal from source to receiver or from transmitter to receiver. BI-DIRECTIONAL PoC(the Receiver is powered by the transmitter). Phoenix RS232 Port for firmware update or RS232 control signal transmission. For better performance, we suggest using solid COPPER ethernet cable with this product. For GUARANTEED optimal performance, use the J-Tech Digital Customized 150ft Cat6 Ethernet Cable. Please search the ASIN number "B01IPYVT3Y" on Amazon for more details.